While I was doing some research for ideas for my sister’s wedding gift, I stumbled upon a YouTube video for a waterfall card. The video gave step by step instructions on how to make one and it looks so different from anything I’ve ever made before. So, I used my sister’s birthday card as the guinea pig! 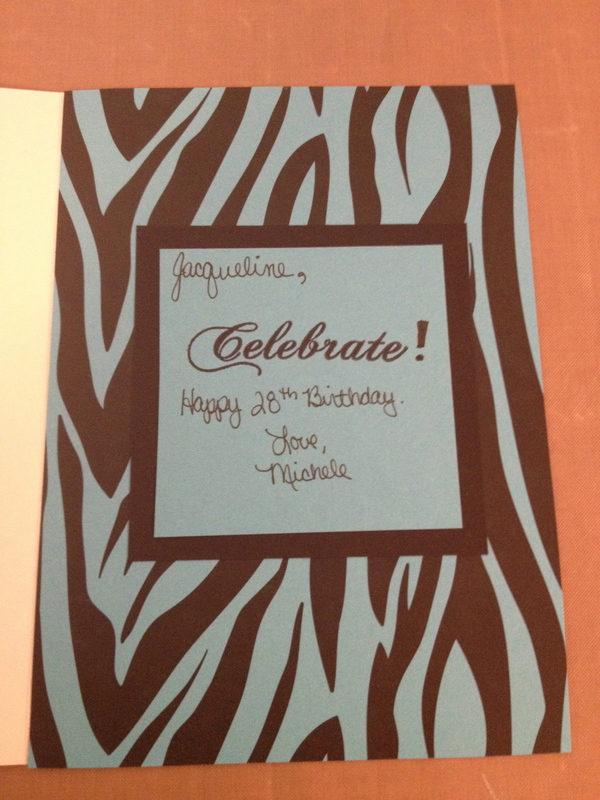 First I started out with an aqua and black zebra striped paper. I have been wanting to use this paper, but haven’t had any projects that it fit with lately. I placed that on a black piece of paper that was a 1/4 of an inch larger on all sides. 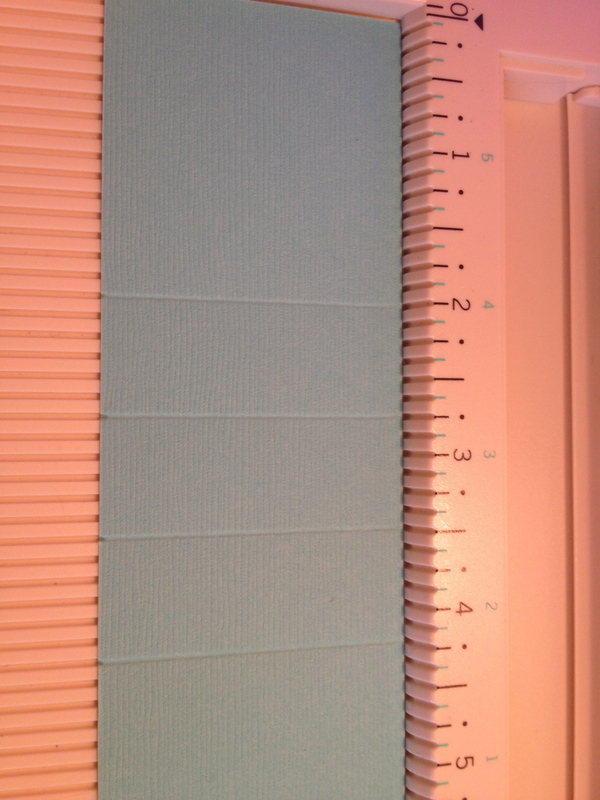 I then took a 2 x 9 inch piece of light blue card stock and scored it at 2, 2 3/4, 3 1/2 and 4 1/4 inches. This paper will be used to hold the 4 pieces of paper with the pictures (or words/phrases if you choose) that will be flipped to reveal the next image. Fold the paper along the score marks and place this piece to the side. Next I cut out 4 black squares at 2 x 2 inches and 4 light blue squares at 1 3/4 x 1 3/4 inches. 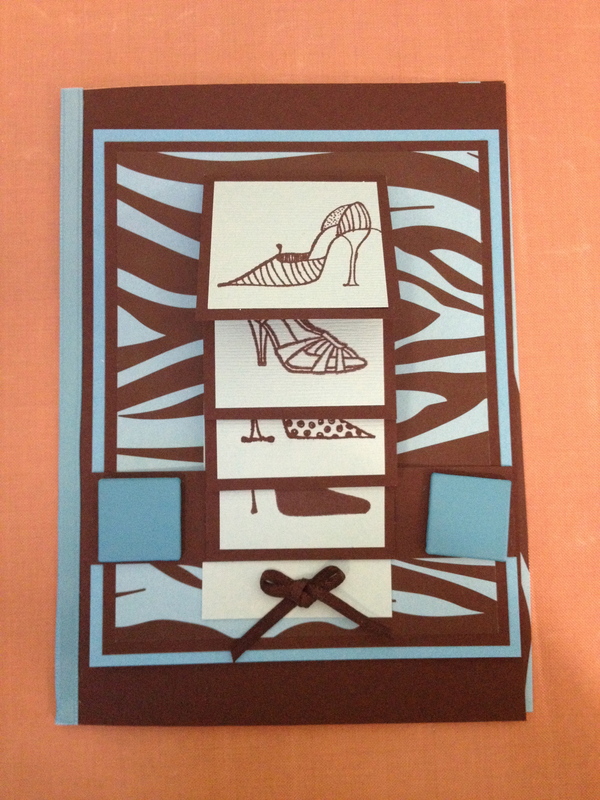 On the light blue squares I used black ink and stamped four different shoe images. I then glued them onto the black squares. The next step is to take those squares and glue them onto the 2 x 9 inch strip of paper. Make sure that you glue the square just under the fold line on the paper. If not, when you go to do the “waterfall” effect, the paper will have a hard time folding. At this point, the images or phrases should be stacked on top of one another, with a small amount of the image underneath sticking out. Before I could glue these pieces down to the card base I had to cut a small strip of black card stock that would house the brads and be the piece that holds the waterfall feature to the card. I put a small amount of ATG glue on both ends of the black strip and then attached it to the zebra and black card stock. I punched two holes at the end with my xacto knife and placed the brads through the holes. For the brads, I used two square ones I had lying around. They were yellow, so I took some paint I had in teal and painted the fronts and the sides of the brad. The brads are used to reinforce the small black strip since a moving part is going to be attached. It gives the card a little bit more stability. To attach the waterfall feature, I placed a small amount of adhesive onto the backside of the shorter end of the waterfall piece and then placed the shorter end on top of the black strip. The tail (longer side) slips under the black band. Once that is in place, pull gently on the tail and make sure that the mechanism allows all the images to be seen and moves smoothly. If it doesn’t, you may have placed a piece too close to the edge where the paper was folded. When you pull the tail down, you see a lot of blank space. I decided that I wanted to stamp something on that end so that there would be a message when you pulled the tail. 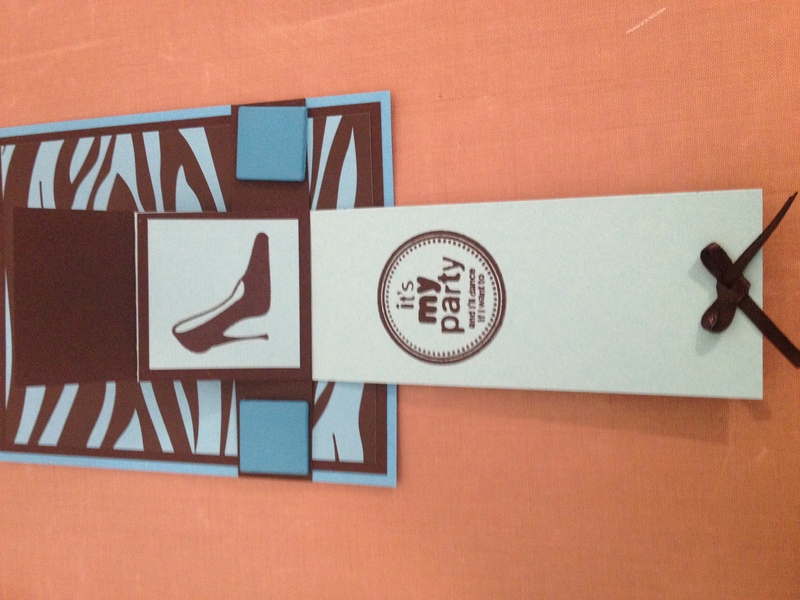 I chose a stamp from the birthday set I had (I believe it was a Fiskar’s set) that was a circle with the phrase “it’s my party and I’ll dance if I want to.” I thought that was appropriate since the images were all shoes! I also attached a small black bow I made from a piece of thin ribbon where you pull to activate the waterfall feature to finish the front off. The last step for the front of the card is to glue this piece to the card base. 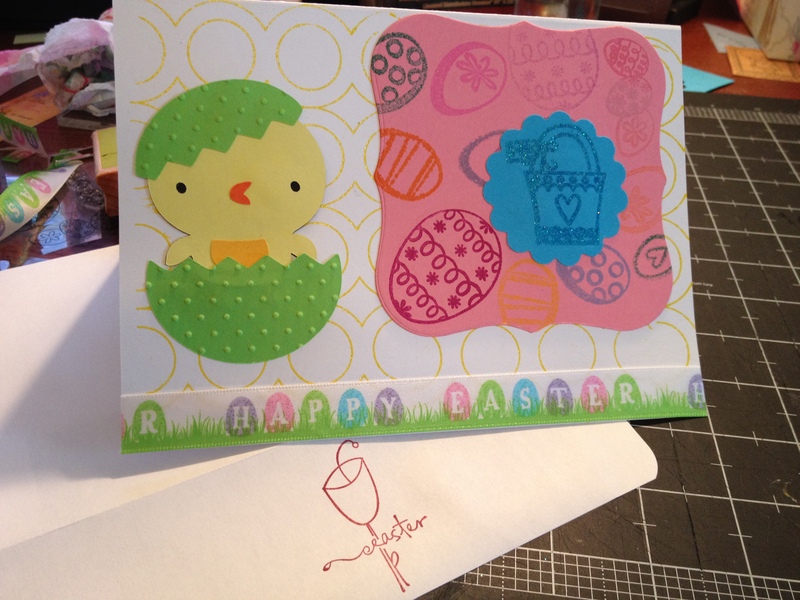 I attach my cards to a 5 x 7 inch white card that I bought in a pack of 50 from AC Moore. 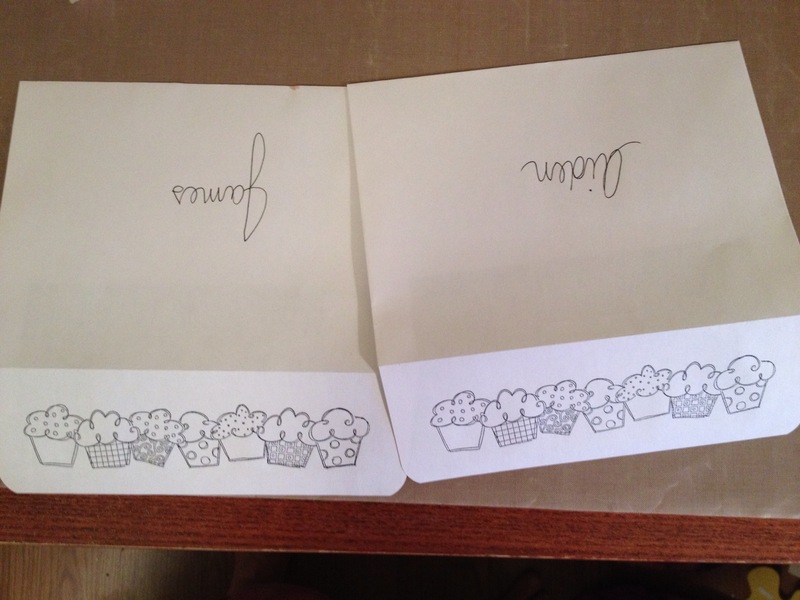 I use these because then I don’t have to worry about making envelopes to fit my cards. Once this was done, I started to work on the inside. 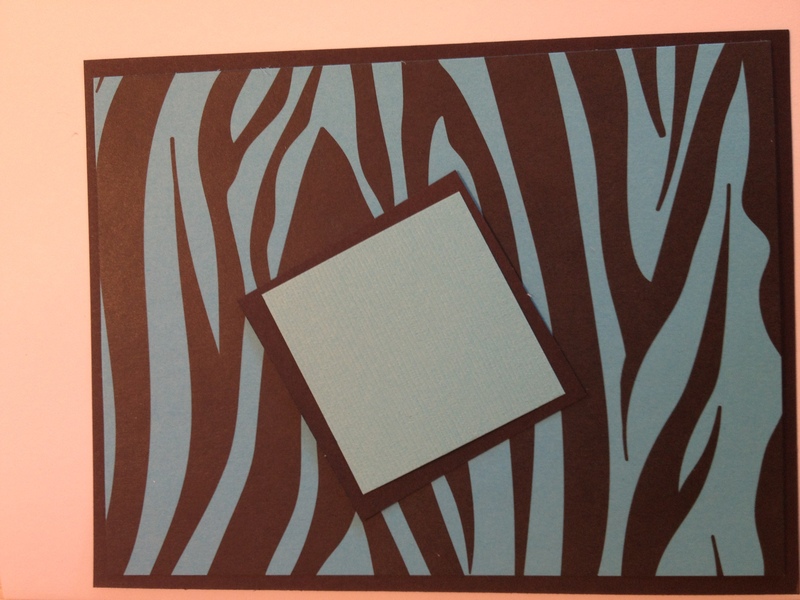 To make the inside match the outside, I took the same aqua and black zebra paper and lined the inside of the card with it. 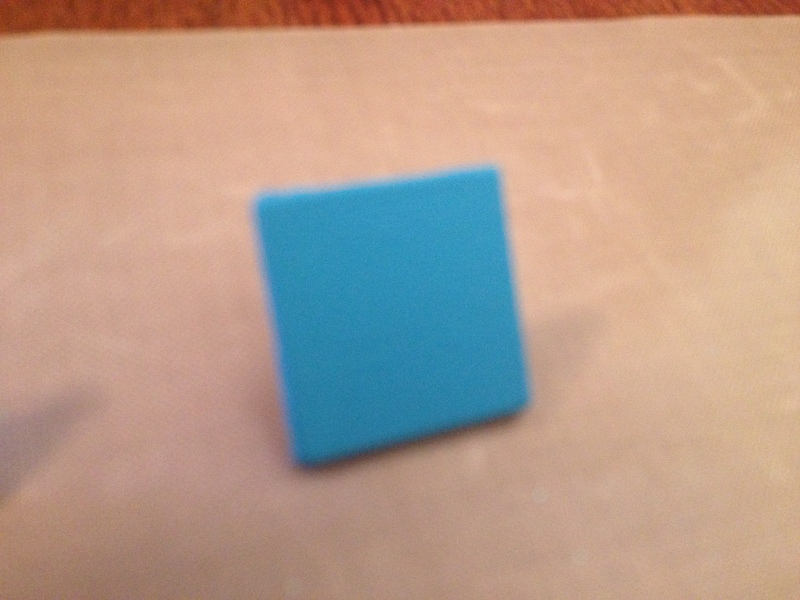 I then took a black square and a smaller light blue square an attached the two. I stamped the word Celebrate in black ink. 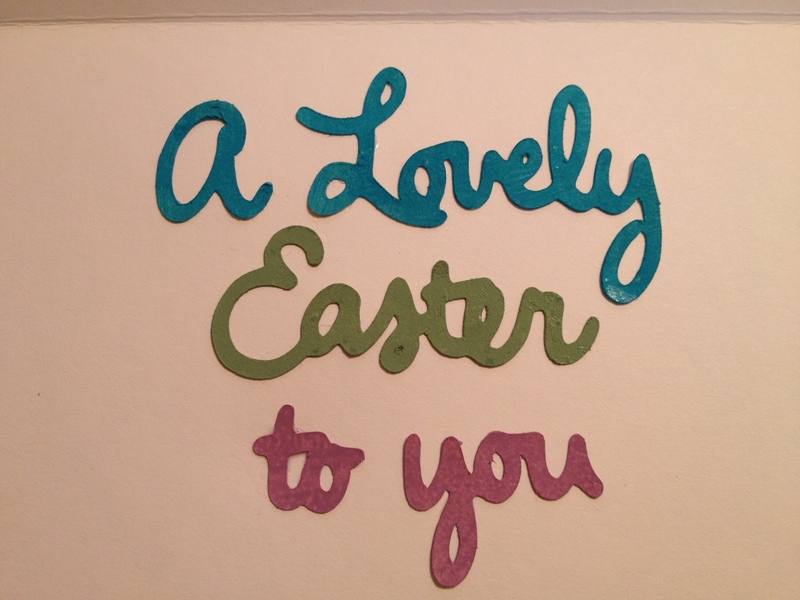 Then I added an exclamation point with a black gel pen and wrote a message to my sister to finish off the card. The waterfall card is a really cool effect. 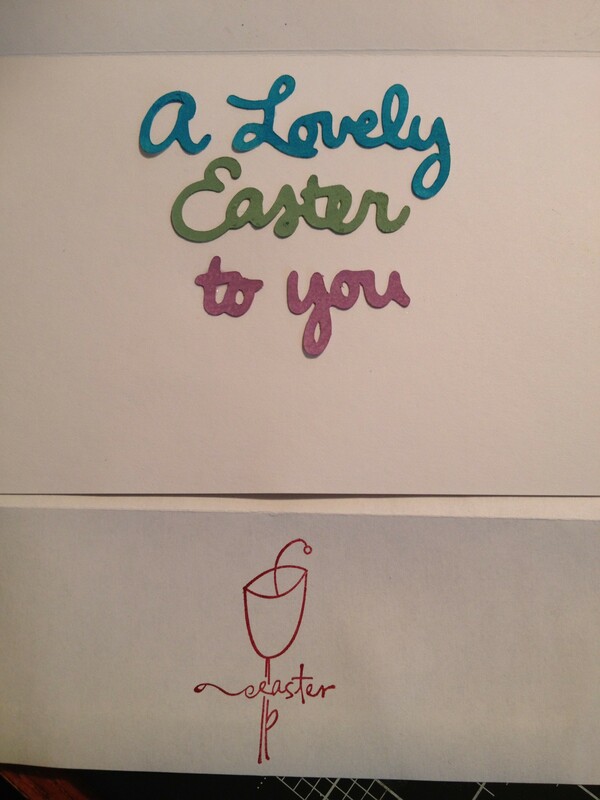 I am going to try this on some of the Christmas cards I make this year. 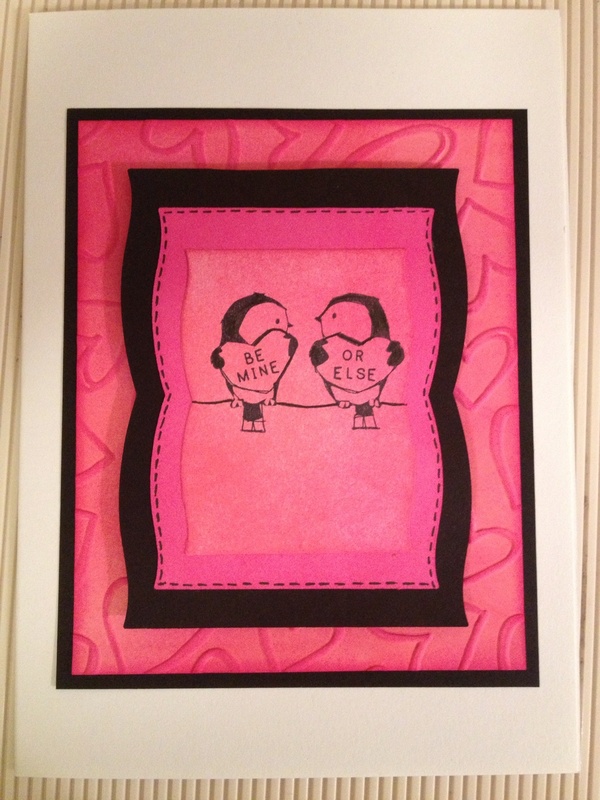 One note – the card is a little heavy because of the layers of paper I used and the brads. I will probably just make it for ones that I can give out and won’t mail because they will probably cost more to mail. I hope that these directions make sense – if any of them are unclear, please let me know! Here are the pictures of the card. Thanks for stopping by! Posted in card making, ideas, scrapbook tips, stamps, Stamps for crafting, YouTube and tagged birthday card, brads, Martha Stewart scoring board, shoe card, shoes, waterfall card, waterfall effect, zebra paper. Bookmark the permalink. Some of you are probably wondering what that is or why you would even need one in scrapbooking. I didn’t think I would need one, until I tried to create a border with a wooden stamp. It’s not very easy and the result wasn’t the best. I had heard of this product, but hadn’t seen it used until I watched one of the YouTube videos a couple of weeks ago. So what is it? Essentially, it is a piece of plastic and a T-square shaped guide. What you do is take a stamp, ink it with some ink of your choice (it doesn’t have to be the color of ink you are using on your layout or card) and place the T-square shaped guide on the top corner of the plastic sheet. Then, you slide the side of the stamp down the side of the T-square guide and stamp the image onto the sheet. (I have found that using distress ink is the easiest because it’s extremely easy to wipe off of the plastic.) After that is done, you take the piece of plastic and place it over the spot where you want your stamped image on the layout or card, place the T-Square on the top left side of the plastic, remove the plastic and place the stamp into the T-Square guide so that the image is perfectly placed on your page! I thought that this product was unnecessary until I got it. I love it because it makes seeing where your image should be placed on the page so easy and it helps you get the image just how you want it. 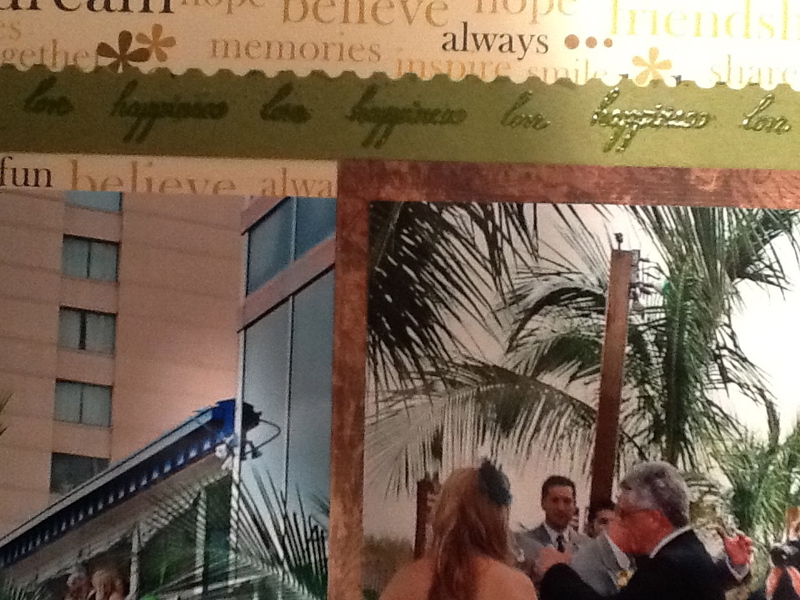 For clear stamps it is easy to see where the image will end up. But with traditional wood mounted stamps, you often can’t tell where the edge is. It really helps when you are working on a page long border where you need to line up the stamps perfectly. If you are doing one of those borders, you stamp the first image, lay the plastic next to the image you just stamped and repeat the process. This way you can control what the spacing is like between images. If it is done properly, it will look like you had one continuous stamp. While this isn’t one of the items that I would say you need to get when you first start scrapbooking, I would suggest that it is something that you want to purchase if you do a lot of stamping. The one I bought is from Inkadinkado. Posted in distress ink, ideas, scrapbook tips, stamps, Stamps for crafting and tagged creating borders, distress ink, how to center an image, ink, repeating a stamped image, stamp-a-ma-jig, stamps. Bookmark the permalink. I wasn’t sure where to start when it came to the list of items for my personal challenges. Do I start with an easier one and work to the ones that are harder or I am more afraid to try? Or do I dive right in to the hardest part? Well, for the first one I took it a little easy. One of the challenges was to use an item from one collection on something that it wouldn’t normally be used on. I thought about using my stamps because I have so many different collections, one of which is called Asian Inspired by Fiskars. 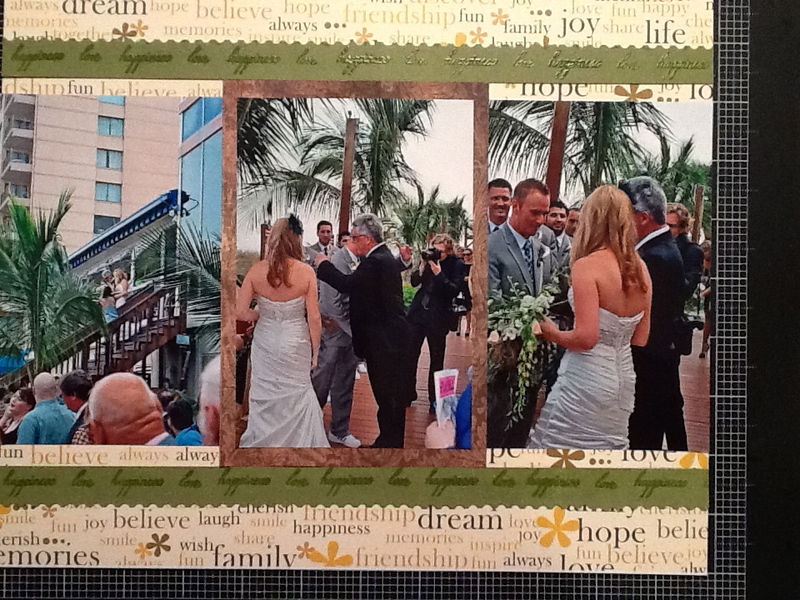 I am working on my friend Erika’s wedding album. 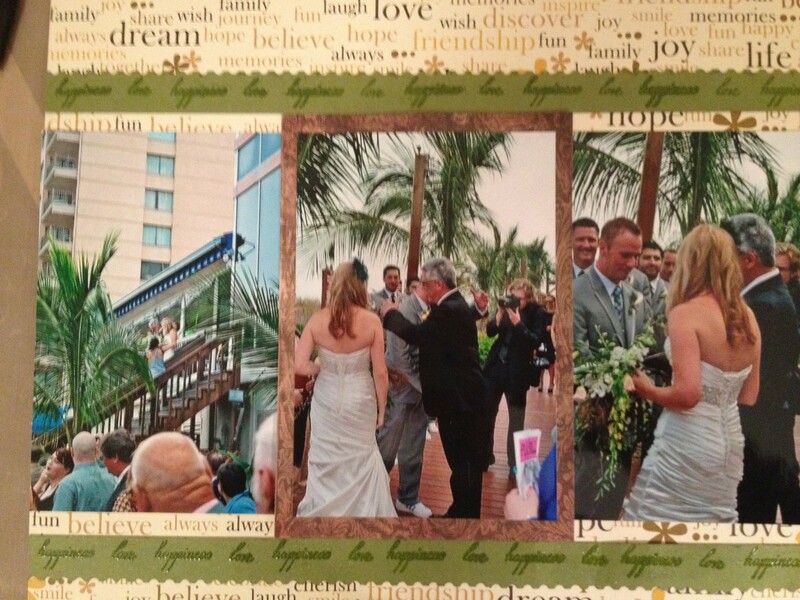 She got married at the beach in Ocean City, MD in September. How could I make these stamps with an Asian influence work for one of her pages? There was nothing about her wedding (which had a play theme to it – the programs were a playbill, we signed records instead of a guest book) that could be linked to these stamps! Three of these stamps are the symbols for love, peace and happiness, with the corresponding word written underneath the symbol. 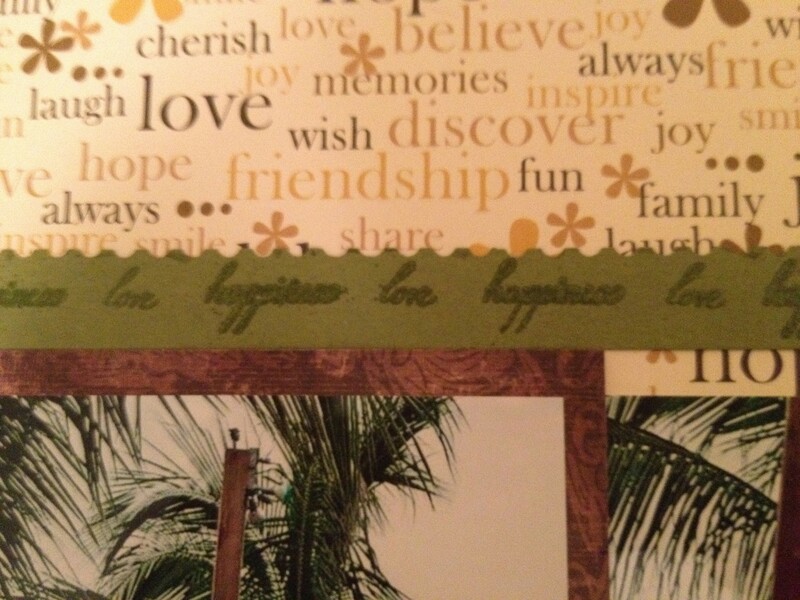 I chose to use just the word part of two (love and happiness) in the page somewhere. Since the words were small, I needed to do something to make them stand out. I punched out a scalloped/postcard edge border by EK Success and then cut the paper to a one inch strip and repeated the process. I then took the stamps and inked them in VersaMark. Originally I chose white embossing powder, but then I remembered I bought some yellow Martha Stewart embossing powder that I wanted to try. 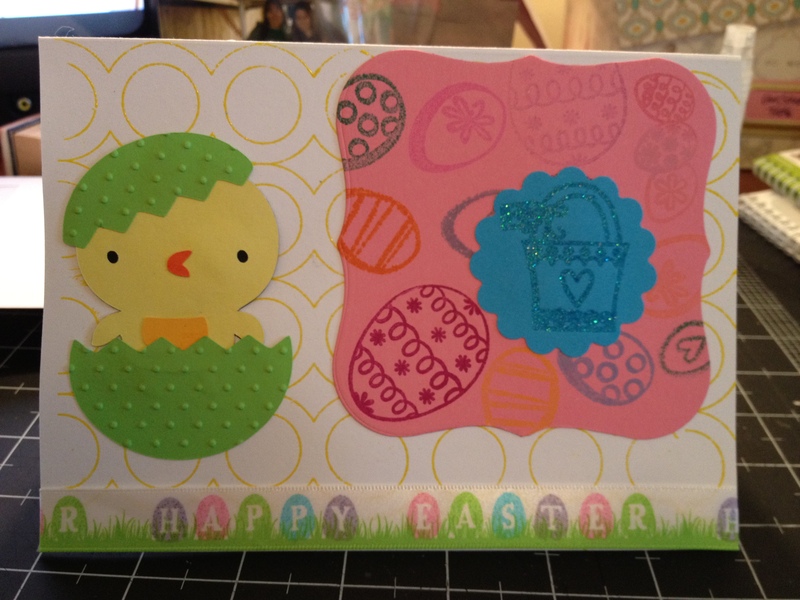 For the second try, I used the yellow embossing powder. With the green paper, it makes the powder almost look clear. For the next project, I am going to try something a little bit more difficult. 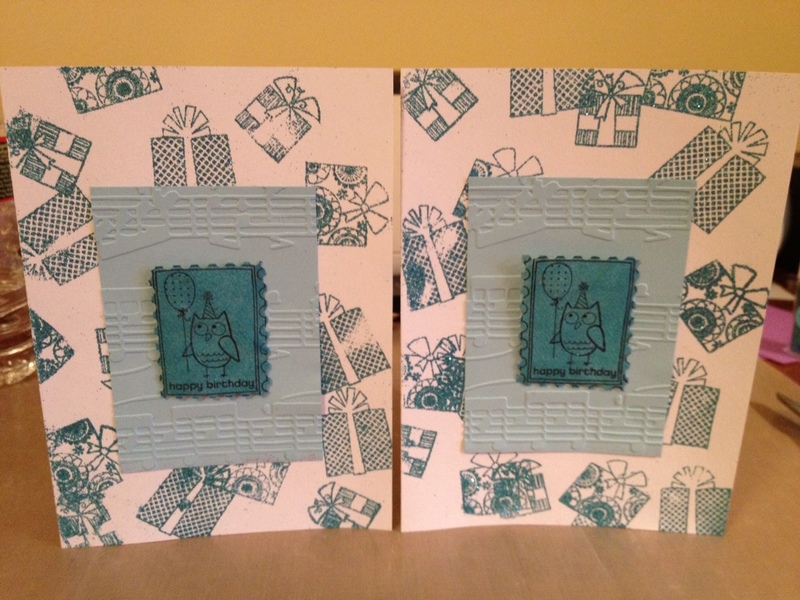 Posted in Challenge, Embossing Powders, ideas, scrapbook tips, stamps, Stamps for crafting, VersaMark. Bookmark the permalink.